As Laozi said in the Tao te Ching, the journey of a thousand miles begins with the first step. But where do we begin when the collective consciousness of the entire global population is available at our fingertips on screens of every size and resolution? There may be no one-size-fits-all approach when it comes to the overall health regarding the human population let alone of regions and countries, individual states and even cities. In order to narrow the scope and focus of a wellness program it seems the best practice is to begin with individual communities and schools to find the most effective combination of physical, nutritional, emotional, mental and social education. I hesitate to use a war analogy but everyday we are thrust headlong into conflict with the biggest battleground being our minds. Attention spans have dwindled due to a constant barrage of images and flashy lights, quick tips, fad diets, but more importantly a constant flow of information. Provocative headlines compete for our click-throughs, advertisers appeal to our basest instincts and sometimes the information we seek seemingly slips through our fingers. This introductory blog focuses on Coordinated School Health Programs and how individual communities can come together to effect the change they desire. Like a bespoke suit, tailored to perfection, individual communities can best assess the health issues that plague them as well as utilize the research that's available to unleash their latent transformative potential. The plethora of issues schools currently face, specifically defunding, is daunting. According to CDC, "health-related factors such as hunger, physical and emotional abuse, and chronic illness can lead to poor school performance.1 Health-risk behaviors such as early sexual initiation, violence, and physical inactivity are consistently linked to poor grades and test scores and lower educational attainment.2-4 In turn, academic success is an excellent indicator for the overall well-being of youth and a primary predictor and determinant of adult health outcomes.5-7 Leading national education organizations recognize the close relationship between health and education, as well as the need to foster health and well-being within the educational environment for all students. "8-11 Additionally, "scientific reviews have documented that school health programs can have positive effects on educational outcomes, as well as health-risk behaviors and health outcomes.12-13 Similarly, programs that are primarily designed to improve academic performance are increasingly recognized as important public health interventions. Schools play a critical role in promoting the health and safety of young people and helping them establish lifelong healthy behaviors. Research also has shown that school health programs can reduce the prevalence of health risk behaviors among young people and have a positive effect on academic performance. CDC analyzes research findings to develop guidelines and strategies for schools to address health risk behaviors among students and creates tools to help schools implement these guidelines." Furthermore, when addressing a collaborative approach to learning and health the CDC recommends, " to have the most positive impact on the health outcomes of young people, government agencies, community organizations, schools, and other community members must work together through a collaborative and comprehensive approach." 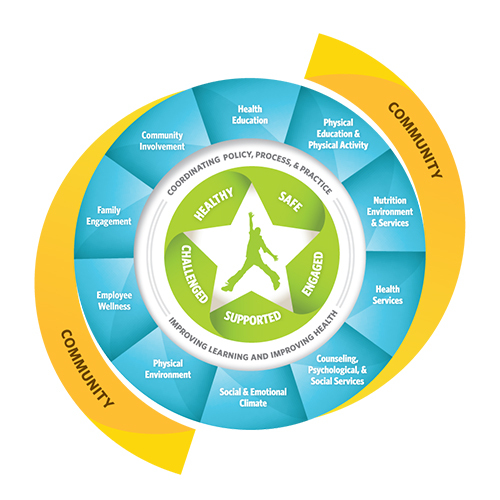 The Whole School, Whole Community, Whole Child (WSCC) model expands on the eight elements of CDC’s coordinated school health ( CSH ) approach and is combined with the whole child framework. CDC and ASCD developed this expanded model—in collaboration with key leaders from the fields of health, public health, education, and school health—to strengthen a unified and collaborative approach designed to improve learning and health in our nation’s schools." The CDC's conclusions lend credence to the idea that it truly does, "take a village to raise a child." Dunkle MC, Nash MA. Beyond the Health Room. Washington, DC: Council of Chief State School Officers, Resource Center on Educational Equity; 1991. MacLellan D, Taylor J, Wood K. Food intake and academic performance among adolescents. Canadian Journal of Dietetic Practice and Research2008;69(3):141-144. Council of Chief State School Officers. Policy Statement on School Health ; 2004. National School Boards Association. Beliefs and Policies of the National School Boards Association . Alexandria, VA: National School Boards Association; 2009. American Association of School Administrators. AASA position statements[pdf 61K] . Position statement 3: Getting children ready for success in school, July 2006; Position statement 18: Providing a safe and nurturing environment for students, July 2007. ASCD. Making the Case for Educating the Whole Child[pdf 1.9M] . Alexandria, VA: ASCD; 2011. Basch CE. Healthier Students Are Better Learners: A Missing Link in School Reforms to Close the Achievement Gap. Equity Matters: Research Review No. 6. New York: Columbia University; 2010. CDC. The Association Between School-Based Physical Activity, Including Physical Education, and Academic Performance. Atlanta, GA: U.S. Department of Health and Human Services; 2010. Freudenberg N, Ruglis J. Reframing school dropout as a public health issue . Preventing Chronic Disease 2007;4(4):A107. Muenning P, Woolf SH. Health and economic benefits of reducing the number of students per classroom in US primary schools. American Journal of Public Health 2007;97:2020–2027.